There is a good chance that your car can be considered your home away from home. Since you spend so much time in it, the trunk of your vehicle probably also doubles as your storage facility. Now, the only problem with this is that things can get pretty cluttered back there and can resemble a disaster zone. If you want a neat and tidy car where you will actually be able to find things, you will need a trunk organizer to keep things in order. When you decide to go shopping for one, the first thing that you may notice is just how wide a selection there is for you. So, how do you decide what the best trunk organizers are? Well, you don’t have to worry because we have compiled a list of some of the top options out there and reviewed them for you. We have also mentioned some of the features that you should look for when looking for the organizers. How Well Can You Organize Your Items in the Organizer? How Secure Is It In Your Car? Size: first and foremost, we looked at the size of the trunk organizer as a whole as this gives you an idea of how much space it will occupy in your trunk. However, we also took into consideration how wide and deep each individual compartment to determine just how many items you could fit into them. Additional Storage: it isn’t just the compartments that make up the storage space in these organizers, though. This is why we also counted the number of additional pockets and sections to see how many smaller items could be stored there. 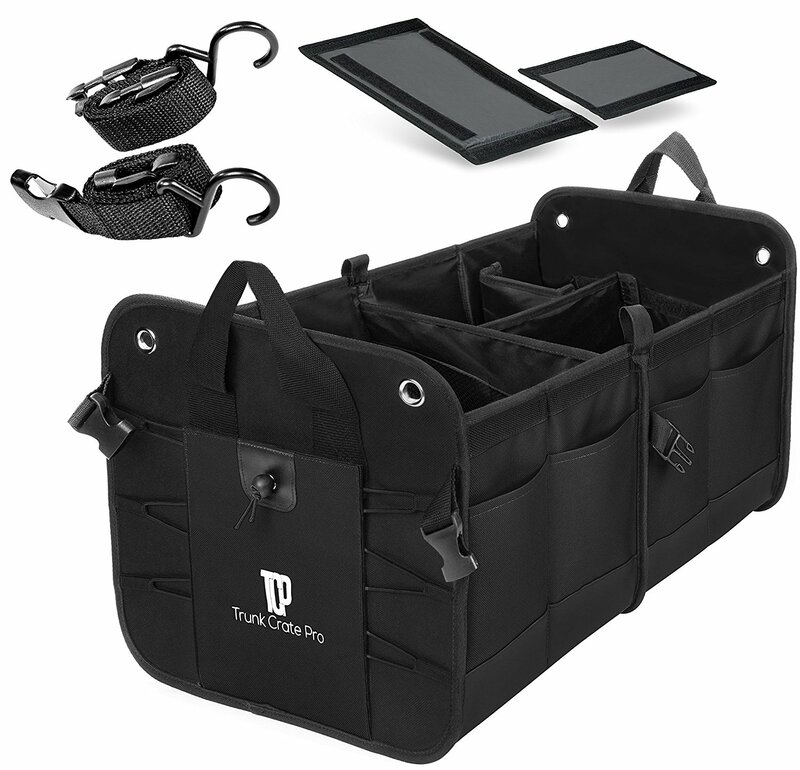 Durability: the organizer is probably going to need to hold groceries, sports equipment, and a lot of other heavy-duty items. So, we examined the type of material that the products were made from and just how well they would hold up to regular and vigorous use. Immovability: you can’t really have your organizer moving around in the trunk of your car while you are driving. So, we analyzed the features and mechanisms that held the organizer in place to see if they would keep it secured at all times. Why we like it: The TrunkCrate Pro Trunk Organizer is a durable product that offers up lots of different storage options. This is a good-sized trunk that has deep compartments that work well for most mid-sized items. The depth of the compartments also ensures that whatever is inside them will stay securely there, even when driving around. In addition to the main compartments, there are lots of expandable pockets on the outside. This gives you the chance to keep smaller items separate and organized. There is even a specific section for bottles which makes storage a great deal more convenient. One of the standout features in this organizer is the removable sub-dividers. These allow you to adjust the compartment size as you choose. So, if you are storing larger items you can simply remove the dividers. However, if you want more organization, you can adjust the sub-dividers accordingly. The other great element is the slider feature. This, too, helps to adjust the compartments depending on what you are storing in it. When not in use, the organizer can be folded and put away. The trunk organizer is kept secured to the floor with the help of Velcro strips. The ones on this product are wide, which allows them to get a better hold on the carpet and not move around. The downside is that the strong Velcro has a tendency to scuff and damage the carpet that it is placed on. This trunk organizer is made from Oxford polyester which ensures that it can withstand continuous wear and tear. Each side of the organizer is also quite thick and sturdy and can easily contain all kinds of items, regardless of weight or size. The organizer has also been designed to be water-resistant and abrasion-resistant, making it suitable for a variety of conditions. Why we like it: The Higher Gear Products Trunk Organizer is a long-lasting organizer that lets you store large and heavy items. This organizer consists of two, large main compartments. This means that you can easily store larger items like sports equipment or camping gear as there is plenty of space to do so. At the same time, it can make organization a little difficult as there aren’t any smaller compartments. There are, however, expandable and mesh pockets on the outside of the organizer. So, if you want to keep a few items separate, you can. 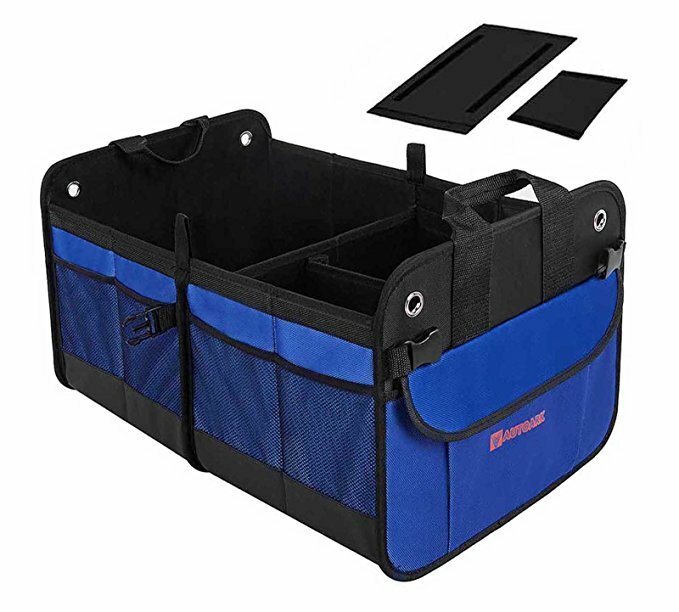 When you are done with this organizer, you will find it incredibly easy to collapse it and to buckle it up into its smaller shape. This makes it a lot simpler to store either inside your car or your home. You will be able to pull it back into shape in no time at all. As an added bonus, this organizer contains a reflective strip on its exterior. This makes it quite visible at night time as well. As far as Immovability goes, this product has rubber feet on the bottom of the organizer. This creates just enough friction for the organizer to catch onto carpet or vehicle floor. As a result, you get an organizer that is quite secure without having to worry that you will be doing any damage to your car floor. 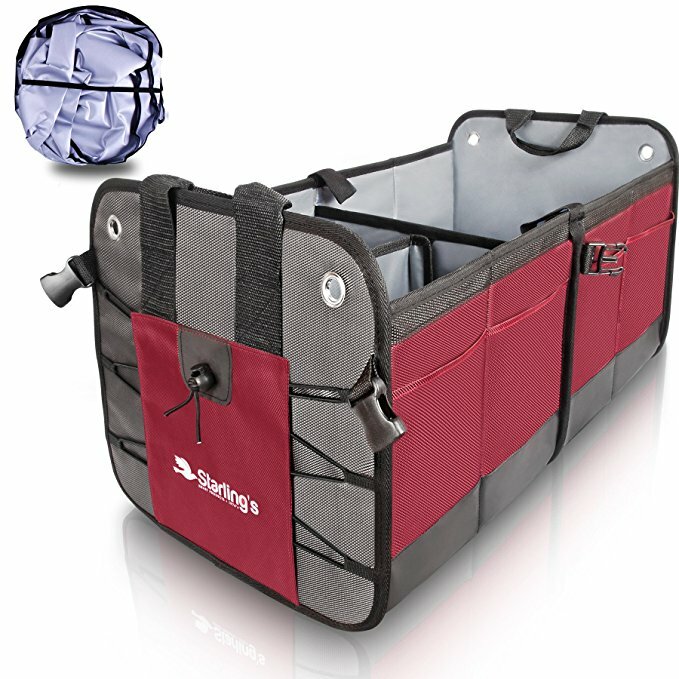 This is certainly a heavy-duty trunk organizer as it is made from 600D polyester. To top it off, it is reinforced with durable stitching so you can be quite certain that the sides will not split, even when it is stuffed to the brim. The bottom of the organizer has also been reinforced so that even when you place heavy items in it, it will not be compromised or damaged in any way. 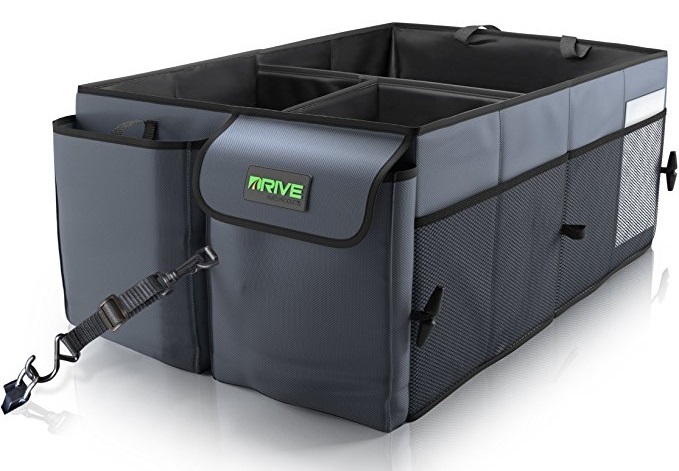 Why we like it: The Drive Auto Products Trunk Organizer boasts a versatile and secure design that allows you to store multiple items. When it comes to storage, you really are spoilt for choice with this organizer. There are three large compartments which allow you to organize the larger items easily. At the same time, there are several expandable exterior pockets, some of which are mesh. These can hold water bottles or numerous other smaller items that need to be kept secure. One of the pockets even has a lid to make certain that the items will not move around. There are several reasons why this organizer is so versatile. To start with, it comes with one removable divider. This way, you can split one compartment into two, offering you greater organization options. Or, it can be taken away completely so that you have a lot more room for larger items. The other reason is that it can actually be made a bit smaller and converted to ‘front seat mode’, enabling you to use this organizer in the front as well. This trunk organizer is kept secure with the help of straps. These ties can be adjusted and attached to the back of the car, much like a cargo net. Or, you can choose to strap it around the back seat. Either option that you decide on, you will be able to drive around with peace of mind, knowing that your organizer will not move at all. This also a rather strong and durable trunk organizer. 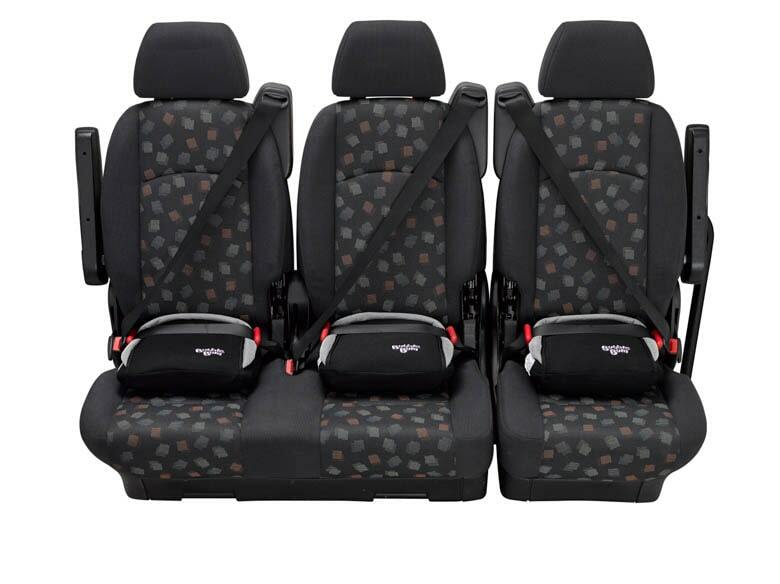 It is made from Oxford premium fabric which is able to withstand continuous wear and tear well. It also has numerous panels and base plates that ensure that the organizer remains upright and sturdy at all times. This makes it a lot easier for you to store larger or heavier items in it as a result. Unfortunately, the handles aren’t as good quality and can rip rather easily. Why we like it: The Starling’s Trunk Organizer is a sizable and durable product that makes it effortless to keep the trunk of your car neat. There are three main compartments in this organizer – they are quite deep and there is lots of room in them. If you are someone who tends to have a lot of clutter in their car, then this organizer will serve you well. It has lots of space and can hold a number of items with ease. There are smaller, expandable pockets on the outside as well. This gives you the opportunity to organize your items a little better. One of the aspects that sets this trunk organizer apart from others is the fact that it can be folded in half. 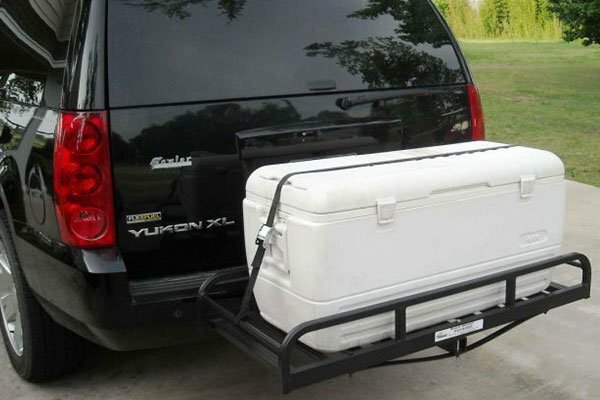 This works well if you don’t have a lot of trunk space and need a smaller product. This feature is also great if you want to briefly move the organizer to the front of the car and store it on the seats. Unlike many organizers, this one has non-slip rubber add-ons at the bottom of the organizer. Now, on most surfaces, these work quite well and hold on, preventing the product from slipping around. However, they don’t always adhere to certain surfaces and in these instances, the organizer can move around while driving. One of the main advantages of this organizer is its durability – it really has been built to last. For one thing, it is constructed from 1680D Oxford polyester so you can be quite sure that it won’t rip or tear easily. The bottom board is also incredibly strong and rigid, as it is composed of three layers. This also creates a waterproof layer which is why this is a great option for groceries, as none of the spills will affect the organizer. 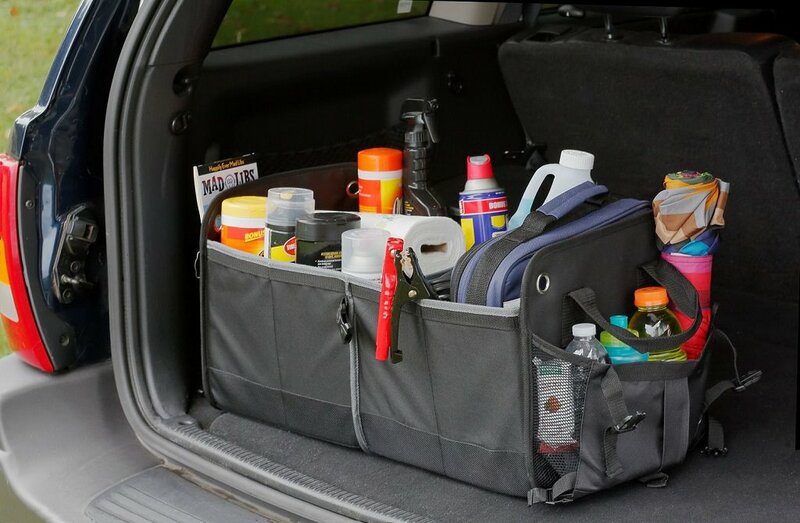 Why we like it: The FORTEM Trunk Organizer provides lots of storage space and organization features, making it a useful product to keep in your trunk. There are three storage compartments in this trunk organizer. They are large and have a good depth which means that you can store larger items. At the very least, you should be able to pile smaller items on top of one another. 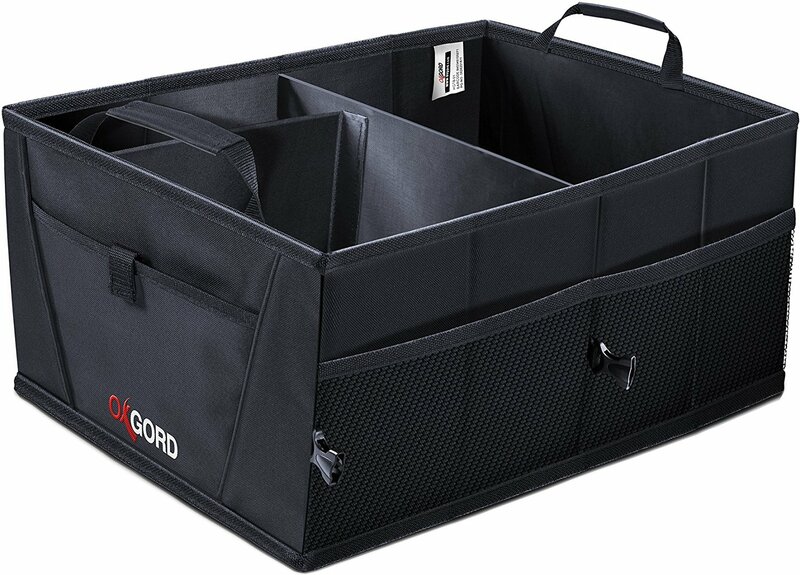 This organizer is a great option for anyone who wants to haul groceries or sports equipment in their trunk. There are also a few external pockets and some mesh pockets as well. The only real issue with this design is the expandable pockets – they don’t really expand so they can’t actually be used to store anything. 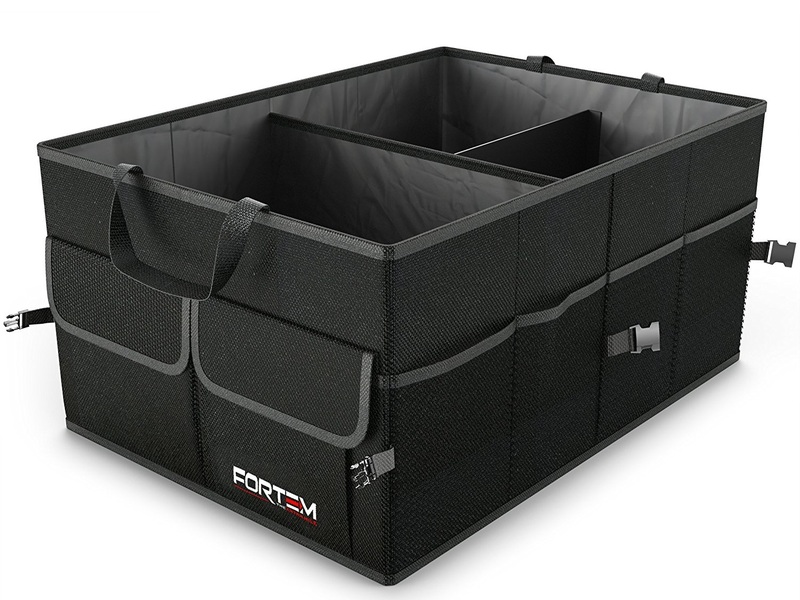 The FORTEM trunk organizer has been designed in such a way that you will be able to set it up in a matter of seconds. However, it will hold firm and steady, regardless of what you put in it. Despite the size and the rigidity of this organizer, you will notice that it is quite simple to fold up. An interesting addition to this organizer is the presence of a lightweight, water-resistant lid. Not only does this keep all of the items inside, it is also great for taking the organizer out of the car. The organizer has two Velcro strips on the underside. These attach to the carpet so that even when you are taking corners, the organizer will remain stationary. 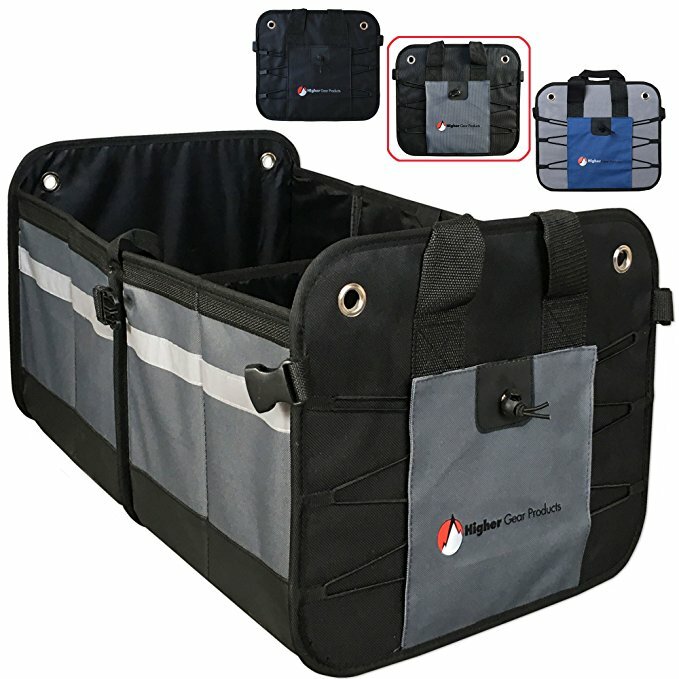 This trunk organizer is made from a 600D polyester material which makes it able to withstand most abrasions and daily use. The sidewalls and the baseplate are incredibly strong as well which is what provides the sturdy structure to this organizer. All of these elements, combined, ensure that this organizer can be used to store a variety of items. Why we like it: The Autoark Trunk Organizer is incredibly versatile as it has plenty of adjustable storage space, great for any car. This trunk organizer is rather large which means that you have a lot of storage space at your disposal. In total, this organizer can provide you with up to four compartments. Each of the compartments is quite deep which allows you to store items of various sizes there. The organizer also has plenty of external pockets and storage. So, you will find it rather easy to separate and organize all of your items with this product. What makes this organizer so versatile is that it has a removable divider. As a result, you can add or remove a compartment, depending on your needs. You should note that the dividers are a bit tricky to setup so that may take some time and effort. This is certainly a durable organizer. To start with, it is made from tough 1680D Oxford polyester material. Not to mention, it also has strong stitching that ensures that the sides will not collapse or rip, even when you place large items in the compartments. What is also great is that the bottom layer is incredibly sturdy. It has a three-layer construction that also makes it water-resistant. This way, you don’t have to worry about spills ruining the material or your car. 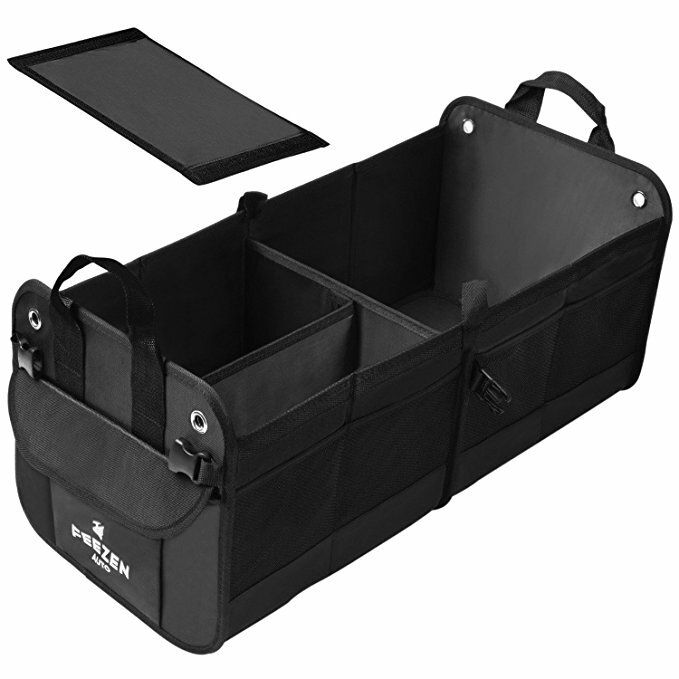 Why we like it: The Feezen Trunk Organizer has great organizational features which makes it easy to keep the trunk of your car neat and tidy. There are up to three compartments available with this trunk organizer but there are two main areas. Each of these is quite roomy which makes this a great product for slightly larger items. The organizer is also quite deep so you can easily store as many items as you need. In addition to the compartments, there are also additional mesh pockets and expandable pockets as well. So, there are plenty of ways that you can organize your items in your trunk. What makes this product such a good organizer is that there is a divider that can be removed as needed. So, if you want to keep certain items separate from one another, inserting the divider will allow you to do this. Also, you will find it quite easy to store this organizer when you don’t require it. This is because it can be folded incredibly flat and then stored in your car or home without taking up too much space. There are long Velcro strips on the bottom of this organizer. 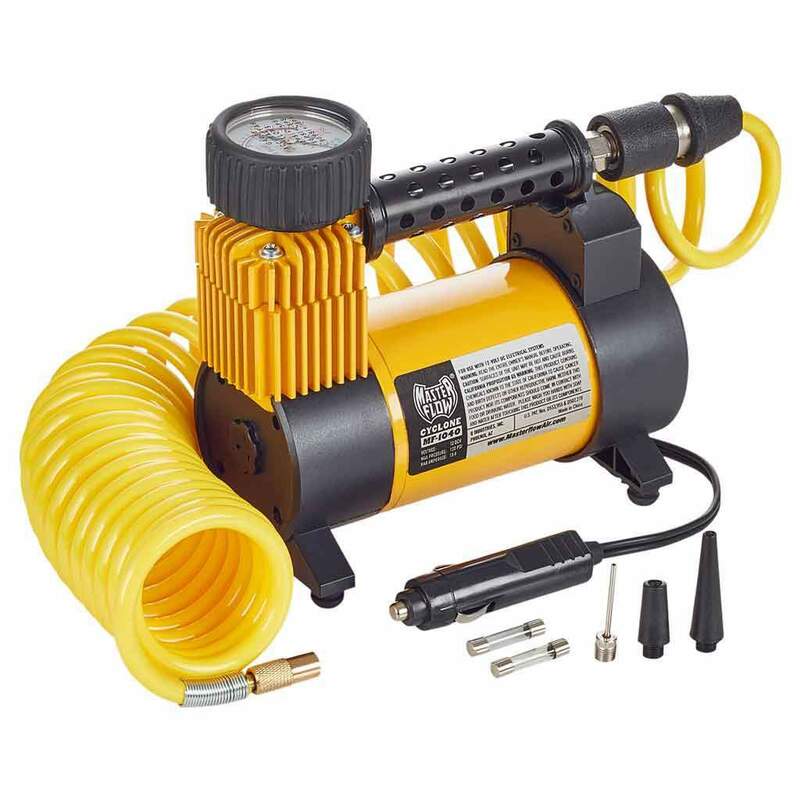 This is what ensures that it will remain attached to any carpeted areas in the trunk of your car. So, you can be quite sure at the end of your drive that your items will be in the same place as when you started out. The material that the organizer is constructed from is of high-quality. It is made from 1680D polyester so it is unlike to wear out or tear easily, even with regular use. The bottom of the organizer is also constructed well and is made from three layers, ensuring that it is also water-resistant. Where this product falls short, though, is with the stitching which hasn’t been executed all that well. So you shouldn’t place overly heavy items in it. Why we like it: The ROLA Trunk Organizer has been designed to make it easier for you to separate your items more neatly. 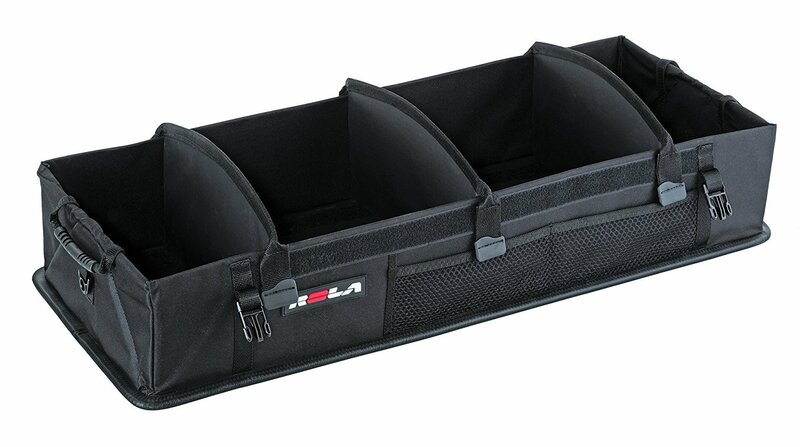 The ROLA trunk organizer provides you with up to four different storage compartment. The compartments are low and wide which makes it easy to access smaller items. At the same time, the rigid walls ensure that you can store larger items as well, without them falling over. There are external mesh pockets that you can use to store smaller or flatter items there. What makes this organizer quite so useful is the fact that all of the dividers can be moved around. So, you can customize the compartments according to the size and width of what you are placing in it. At the same time, you get to have up to four different compartments, if you choose, which means that you get to properly organize all the items in it. Also, when folded, this organizer lays incredibly flat making it easy to store. Unfortunately, immovability is where this organizer fails a bit. The bottom of it is constructed from non-slip material. For the most part, it will adhere to the floor of your car and not move around. However, if you are driving a bit fast or taking corners, there is a chance that it will slip about. So, it will not work too well with items that can spill out. This trunk organizer is made from durable material that isn’t easily scuffed or damaged. At the same time, it also boasts a rigid construction and walls that hold strong. As a result, you can be quite sure that it will not collapse on itself. It also means that this organizer is more than capable of holding even heavier items in place. Why we like it: The MaidMAX Trunk Organizer is a simple yet effective product that works well with most car trunks. There are two large compartments that can easily hold a number of items. Each section is quite large and deep so this is a great option if you want to store as many items as possible. However, if you are looking for a lot of organization features, you may be disappointed. Still, you will find that there are plenty of external mesh pockets that you can use. These go a long way in helping to keep the smaller items separate from one another. While this is a sizable organizer, you will be surprised at just how well it can fold in on itself and lie flat. So, if you are looking for an organizer that can be stored in your home or car easily, this is the one for you. Similarly, it is just as easy to set up and will only take you a matter of minutes. One of the only real failings in this organizer is the fact that there aren’t any securing features. There aren’t straps or Velcro strips. As a result, there is a good chance that the product will move around while you are driving. So, it may not be suitable for you to store groceries or similar items. 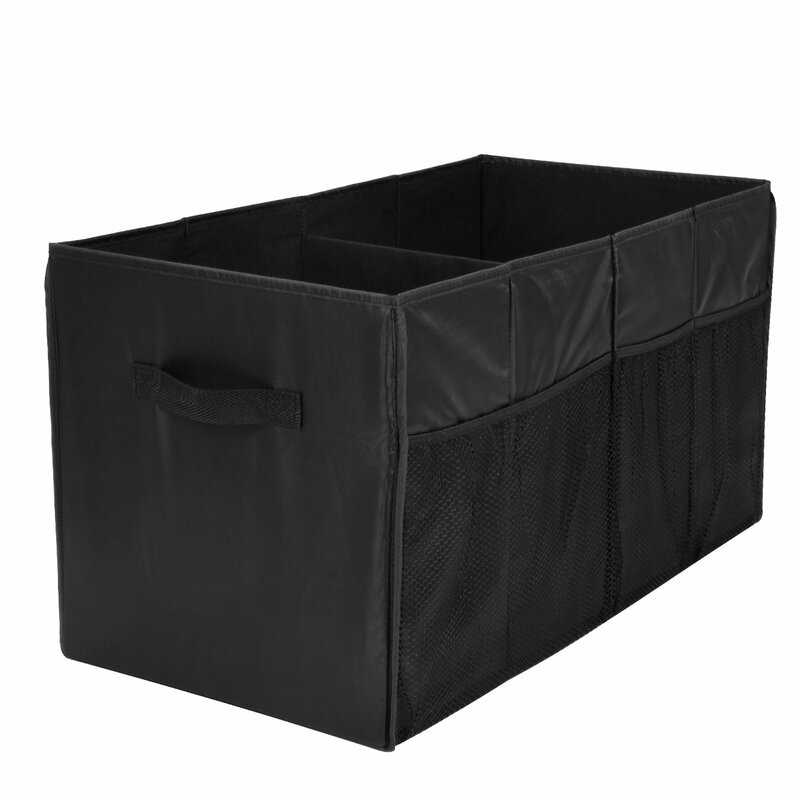 This trunk organizer is made from durable polyester. As such, it holds up well to regular use without a problem. You are unlikely to have to deal with any tears and damage even if you use the organizer on a continuous basis. The sides and bottom of the organizer are also quite sturdy which allows you to store items that are either large or heavy. The handles, too, are quite durable so you can lift it around, even with bulky objects in it. Why we like it: The OxGord Trunk Organizer has deep compartments that make it easy to properly store a variety of items in it. There can be up to three storage compartments in this organizer although there are two main sections. While this doesn’t offer up too many organizational options, it does mean that you can keep larger items in this organizer. So, if you aren’t too concerned with separating all the items, then this product will work well for you. That being said, the organizer is equipped with several external pockets. These can be used to quickly store the smaller items apart from one another. This organizer has a removable divider. So, depending on how you want to store items, you can either create two or three compartments. The adjustment can be made rather quickly and easily so that you can convert the compartment in seconds. The same can be said for the entire setup of this organizer. It can be either folded or unfolded very quickly. One of the main drawbacks with this organizer is the fact that there is nothing to hold the product in place in the trunk. There aren’t any Velcro strips or straps. So, when you are driving around, it can be difficult to determine whether or not the items will remain in place. The material used to construct this organizer is quite durable. However, what isn’t quite as certain about this organizer are the sides. Since they can be folded so easily, they aren’t all that rigid. So, if you aren’t really placing too many items in the organizer, there is a chance that the sides may be a bit flimsy. This is why the organizer will most likely work best with larger or bulkier items. There are lots of trunk organizers labeled as ‘universal’ size. The thing is, you can’t actually know whether the organizer will fit in your trunk, based on this description alone. This is why you should always check the dimensions of the product beforehand – this includes the height. You can then compare these measurements to those of your trunk. After all, most trunk organizers are meant for most standard trunks. So, if you have a smaller vehicle, the organizer just might not fit. Of course, you should also think about the other items that you want to store in your trunk as well. If you only want to keep the organizer in the back, then this will not be an issue. However, if you want to keep other bags, tools, or equipment, then you are going to have to take this into consideration when determining the organizer size. The next thing to think about is whether the organizer allows you to neatly separate your items. This is dependent on the number of pockets and compartments in the product. So, if you are more concerned with keeping your items in separate compartments, then you need to look for an organizer with a greater number of compartments. You should also get one that has lots of external pockets and mesh compartments as well. This will make it a lot easier to keep the trunk of your car neat. As you can imagine, you need to ensure that the organizer is durable and able to withstand daily use. This becomes especially important if you want the best trunk organizer for groceries. There are a few ways to figure out whether an organizer is strong or not. The first would be to look at the material it is made of. Now, most organizers are constructed from polyester. This is good as it tends to be quite tough and is resistant to most wear and tear. At the same time, it can help to take things one step further and consider the denier of the polyester. This refers to the thickness of each strand of polyester used in that sheet. Typically, a higher denier often denotes a tougher fabric. So, look for organizers with 600D and over for the best results. The other feature to look at is the stitching. After all, it doesn’t matter how strong the material is if the stitching won’t hold up. Ideally, you should consider a double stitched seam as this has stronger binds. So, you will be able to fill the items with a larger number of heavier items and still know that it will hold. Last but not least, you should also make sure that the bottom part of the organizer is made from sturdy materials. This part of the product tends to determine just how well the organizer will hold up when you are carrying it. It is a good idea to see if the bottom is water-resistant or waterproof. This way, you will be able to carry groceries in your organizer without worrying that drips or spills will ruin it or damage it in any way. When the trunk organizer is filled with items, the last thing you need is for it to move around in the back of your car. You need to ensure that it stays steady, even when you take the corners rather quickly. To make sure of this, you need to look at the immovability features on the organizer. Usually, you will find either Velcro strips or rubber pieces on the bottom of the organizer. Or, there will be straps to tie the organizer to either end of the trunk. If you have a carpeted trunk, then Velcro will often be your best bet. However, you should keep in mind that very strong Velcro may damage the fibers on the carpet as well. Straps also work well, depending on whether they are adjustable and can secure the organizer tightly. Of course, even with these, there is a chance that the organizer may topple over if you brake after driving quite quickly. Rubber pieces are a great way to add friction to the bottom of the organizer. However, depending on the kind of surface in your trunk, this may not always work as well as you want. So, there you have it, all of the things you need to know about choosing a trunk organizer for yourself. If you don’t want to go through all that hassle, just choose an appropriate one from the list that we have provided you with.